Play Shoot! - New Video Slot At All Slots Casino With $200 Welcome Bonus. This month's Microgaming new games are packed with thrilling bonus features. As an added benefit, All Slots casino is offering double loyalty points on the new games through May 11th. Another game in the May's Microgaming release - Untamed - Bengal Tiger Video Slot that is 243-way-win slot, featuring vibrant imagery of endangered animals and introducing 3 new bonus features: Collect-A-Wild™, Lucky Nudge™ and Your Gamble™. Based on the iconic sports magazine established in 1960, this entertaining 50-payline video slot machine features nostalgic football imagery with a range of bonus features that are sure to score a win with online slot players. The game includes a generous Wild symbol, and if 3 or more scatter symbols land, the Trade ‘Em Bonus is triggered, leading to either the Free Spins Bonus, awarding up to 35 free spins with doubled (2X) payouts, or the Magazine Bonus Round for random cash rewards. 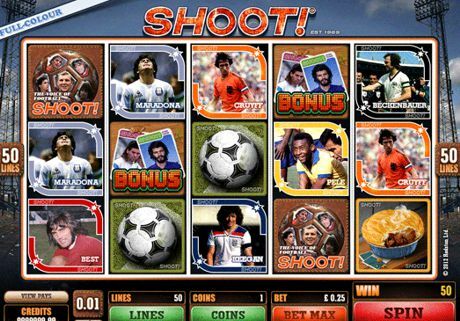 Relive the glory days of football's greatest moments in this brand-new slot game based on the iconic Shoot! Magazine - one of the most popular sports magazines in the World. Experience the beautiful game and win fabulous rewards! Step inside the pages of "Shoot! 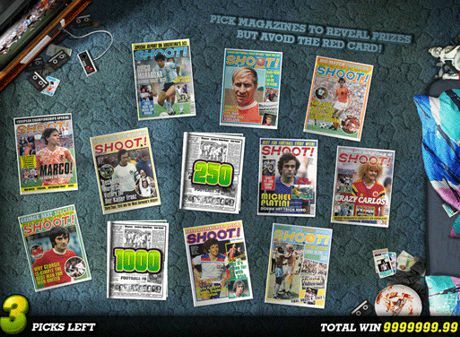 ", the greatest football magazine ever, to recall the glory days of football history and win real cash jackpots with the Shoot! online slots game. Along with great football memories, Shoot online slot offers free spins, wild and scatter symbols, and a three-tiered bonus round, along with exciting sound affects that make you feel like you're right there in the fooball stadium. Shoot! is a 5-reel 50-payline slot machine featuring images of the greatest football players of the 1960s, '70s, and '80s. The legendary Pele, along with superstars like George Best, Diego Maradona, Johan Cruyff, Franz Beckenbauer, and Kevin Keegan all appear as slot machine's winning symbols that can award big cash jackpots when they appear on an activated payline. If you get three or more Bonus symbols scattered anywhere on the reels of the Shoot! online slot, you will first of all win a big prize of up to 200 times your bet. In addition, you will have a chance to play the main bonus round of this online slot: the Trade 'Em bonus game. The Trade 'Em bonus game displays 12 trading cards of football greats of the past, such as Socrates, Gordon Banks, Bobby Moore, and Ruud Gullit (see picture). You get to pick any 4 trading cards and keep the coin prizes they reveal. Occasionally, however, your chosen trading card will not give you a cash prize but something even better: entree into one of the 2 secondary bonus games: the Magazine bonus game or the Free Spins round. In the Magazine bonus round, you will see 12 vintage "Shoot!" magazines strewn about on the bedroom floor. Keep picking magazines and collecting prizes until you pick the dreaded Red Card, which will end your Magazine bonus and return you to your unused picks in the Trade 'Em bonus game. In the Free Spins, you spin the plastic wheel to see how many free spins you get: anywhere from 10 to 35 free spins, with all winning payouts doubled (2X multiplier). "Shoot! : The Voice of Football" was the well-known slogan of "Shoot!" magazine and it is also the slogan of the Shoot! online slots wild symbol. The wild symbol can substitute for any other symbol to create a winning slots payline. It can also be a winning symbol by itself: 5 wild symbols on a payline will award you a slots jackpot of 7,500 times your bet on that payline. Shoot is the Voice of Football and the Voice of Online Slots jackpots too. Football is, in the eyes of many, the world's greatest sport, so come play slots online enjoy some genuine football nostalgia with Shoot! slot machine at All Slots Online Casino, the world's greatest slots casino. Play new slot games with up to €/$200 bonus on your first deposit. Download FREE casino software, register as a Real Money player, make your first deposit and claim your 100% match welcome bonus up to 200 free credits!